A statue of a soldier still stands atop the Enniskillen cenotaph on November 9th, 1987. An anonymous letter-writer to the Irish government 30 years ago claimed that British intelligence knew in advance about the Enniskillen bombing but chose to do nothing about it as they believed it would create a “massive backlash”. The Enniskillen bombing on Remembrance Sunday, November 8th, 1987, was one of the worst atrocities of the Troubles. 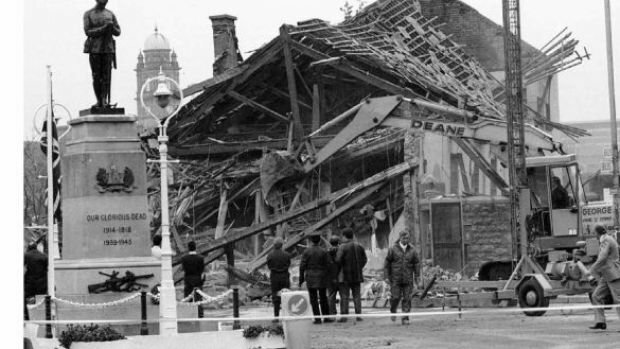 Twelve people were killed when an IRA bomb blew out the walls of a building beside the cenotaph in the town, burying dozens of spectators in rubble. Six days after the bombing, an anonymous, typed letter was sent to then tánaiste and minister for foreign affairs, Brian Lenihan. It has now been released as part of the 1988 State papers. The letter was sent by a man who claimed that he was so scared that he drove across the Border to post it. He claimed that he was an MI5 agent operating in Northern Ireland for 18 months and that he worked in the special section which was set up to infiltrate paramilitary organisations. He listed ways in which British intelligence sought to target republican paramilitaries including the manipulation of Dessie “The Border Fox” O’Hare, “a psychopath”, through his wife. He went on to state that his section of MI5 knew in advance of plans to bomb the Remembrance Day parade in Enniskillen. British intelligence knew when and where the IRA gang were going to plant the bomb, its size and technical make-up, he claimed. The self-proclaimed operative also suggested that MI6’s involvement in the Dublin and Monaghan bombings had been “well-established” in MI5. The anonymous letter generated only one piece of correspondence in the files. It was from an official in the Department of Foreign Affairs to an official in the Department of Justice. It noted that the letter was sent in an envelope to the tánaiste but was addressed to “Dear sir or madam”. The official suggested that perhaps the letter was meant for a wider circulation including the press.